Hystou mini pc is same as normal computers, the way getting to safe model is same as other computer users, only differs depends on the system you use, here are details for different windows users. 1. 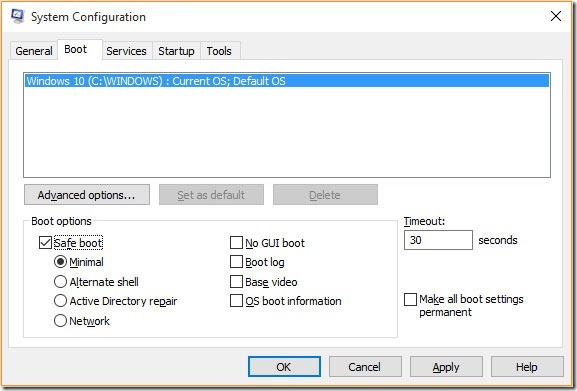 Press the Windows key, type Change advanced startup options, and then press Enter. 2. Under the Recovery tab, select the Restart now option under Advanced startup. 3. After a moment, you’ll see a menu with three options, select Troubleshoot. 4. Select Advanced options, Startup Settings, and then the Restart button. 5. You should see a screen just like the one pictured below. Select your appropriate Safe Mode option by pressing the corresponding number on your keyboard. 1. Press the Windows key and the R key together to access the Run option. 2. Type msconfig in the Open: field. 3. 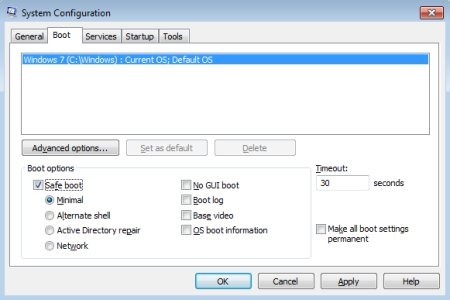 In the System Configuration window, click on the Boot tab. 4. On the bottom left, in the Boot options section, check the box for Safe boot. 5. Select the Minimal option, then Apply, and then the OK.
6. Restart the computer and it should load into Safe Mode. Note: If you use the above option to access Safe Mode, you need to follow the same steps and uncheck the Safe boot option when you’re done. Otherwise, your computer will continue to automatically boot into Safe Mode each time you restart it. 5. You should see a screen just like the one pictured to the right. Select your appropriate Safe Mode option by pressing the corresponding number on your keyboard. 1. Note: The following method will not work if you have a solid state drive (SSD). If you have an SSD, try the next section. 2. When the computer is booting, press and hold the Shift key, and tap the F8 key repeatedly until the Recovery screen appears. 3. Click the See advanced repair options option on the Recovery screen. 4. On the Choose an option screen, select the Troubleshoot option. 5. 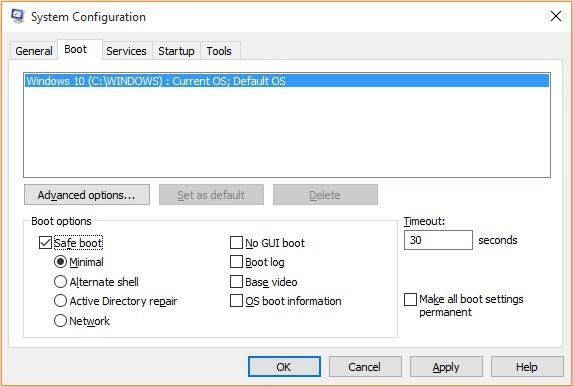 Select Advanced options, and then Windows Startup Settings. 6. On the Windows Start Settings screen, click the Restart option. 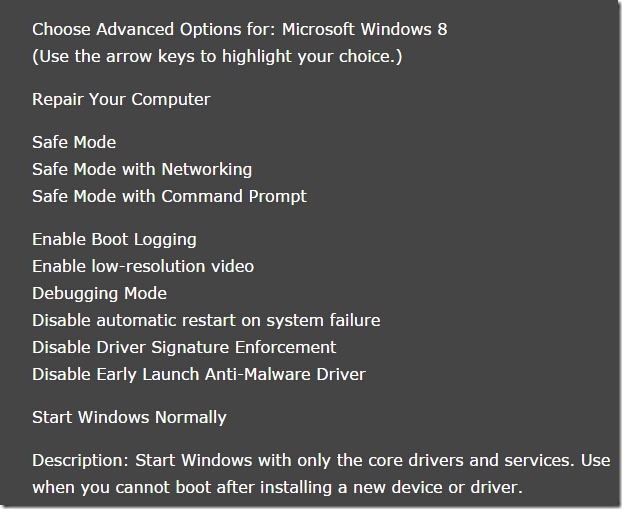 Note: If you have trouble getting to the Recovery screen in step 1 above, you may have to try it several times, with several reboots of your computer. 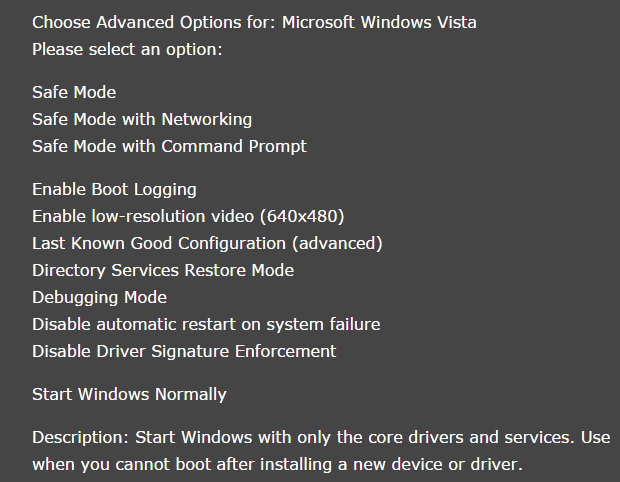 When the computer restarts, you should see the standard Choose Advanced Options screen, similar to the example below. Use your arrow keys to move to Safe Mode and press Enter. Tip: If you are running Safe Mode because you cannot get into Windows, you may want to first try loading the last known good configuration. 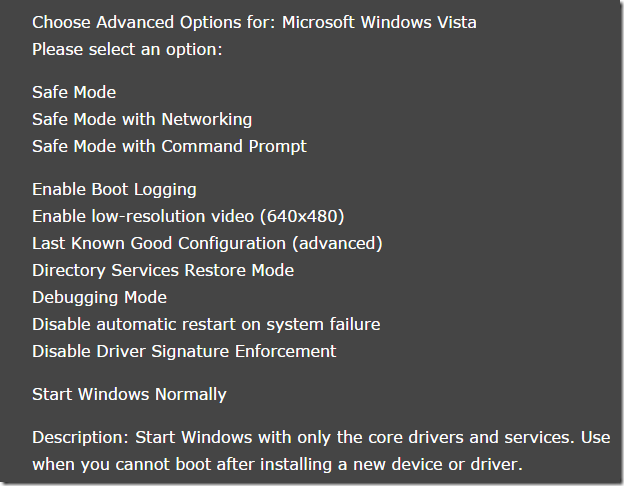 To get into the Windows 7 Safe Mode, as the computer is booting, press and hold your F8 Key, which should bring up the Choose Advanced Options screen as shown below. Use your arrow keys to move highlight Safe Mode and press your Enter key. Note: On some computers, if you press and hold a key as the computer is booting, you will get a stuck key message. If this occurs, continuously tap F8 upon startup rather than holding it. 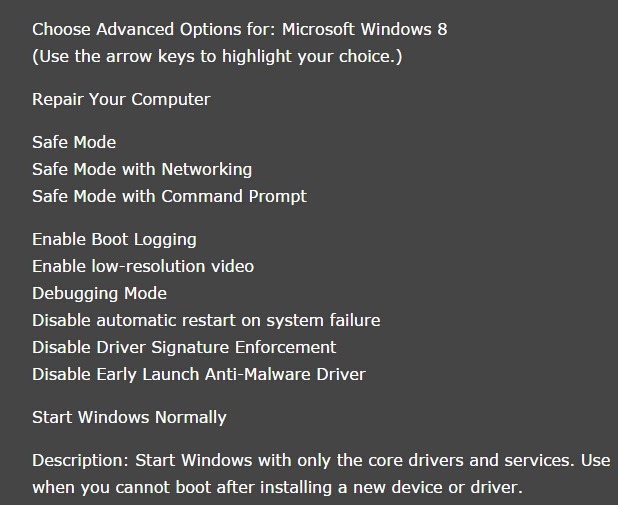 Trouble Getting into Safe mode – If after several attempts you are unable to get the Windows Advanced Options Menu screen to come up by pressing F8, turn off your computer while it is loading into Windows. When the computer is turned on the next time, Windows should notice that the computer did not successfully boot and give you the Safe Mode screen like the one shown below. 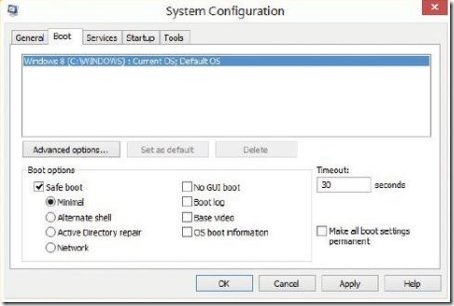 Once you’re done in Safe Mode, if you want to get back into normal Windows, restart the computer. Click here to get additional information about getting out of Safe mode.